As the second workshop in our Rewiring Consent program series, the Twine workshop presented opportunity to consider how the affordances of a choice-based story app can illuminate conditions in which agency and intention are restricted. Twine is the open-source interactive fiction platform that rose to national attention as the format of Depression Quest, the target of GamerGate. 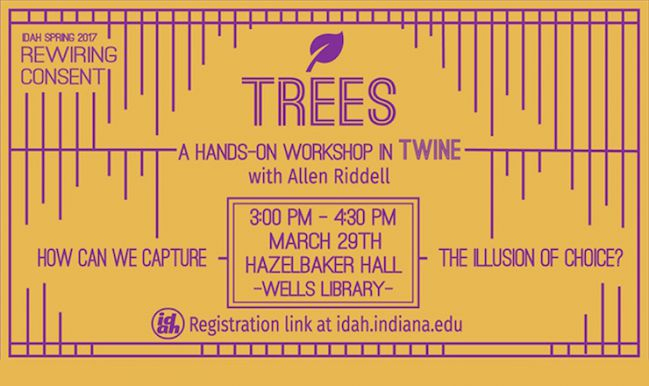 The workshop asked participants to try out Twine’s decision tree structure. As part of our critical discussion of the platform's affordances, we look at how Twine can be used to represent campus Title IX data related to sexual assault. Doing so will require us to take into account the degree to which the ‘player’ in such a scenario can control the game’s action or flow.